First Clip From Justice League: Flashpoint Paradox. Justin Chambers, Kevin McKidd, Michael B. Jordan and Nathan Fillion voice the animated adaptation of Geoff Johns’ 2011 comic book miniseries. 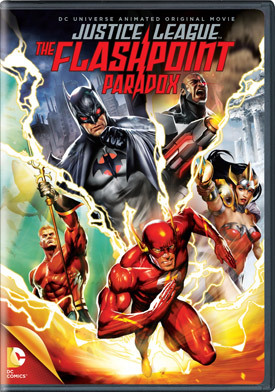 See the movie trailer, DVD, Blu-ray special features and cover art for Justice League: The Flashpoint Paradox below. When time travel allows a past wrong to be righted for Flash and his family, the event creats an alternate reality. Amidst a new world being ravaged by a fierce war between Wonder Woman’s Amazons and Aquaman’s Atlanteans, Flash must team with a grittier, more violent Batman and government agent Cyborg to restore the continuity of Flash’s original timeline. We all wish for the chance to go back in time and change the things, for The Flash, that coveted chance is within reach. He traverses time to right a violent, decades-past crime against his mother, but the ripples of his good intentions prove disastrous, as a fractured, alternate reality now exists in place of the familiar one. Stumbling through this twisted reality where even Superman is nowhere to be found, The Flash seeks the trusted wisdom of Batman, only to find a grittier, more violent Dark Knight in his place. Together with the help of Cyborg, they race to restore the continuity of Flash’s original timeline while this new world is ravaged by a fierce war between Wonder Woman’s Amazons and the Atlanteans, led by a battle hardened Aquaman. 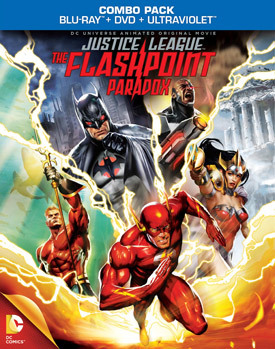 “Justice League: The Flashpoint Paradox” will be released on DVD, Blu-ray, On Demand and Digital Download.